HD Deve Gowda's Janata Dal (Secular) or JD(S) is contesting the 2018 Karnataka assembly elections in alliance with Maywati's Bahujan Samaj Party. HD Deve Gowda (left) could be the king-maker in the 2018 Karnataka assembly elections. Mayawati's indifference to being on time is not a new feature of her political persona. 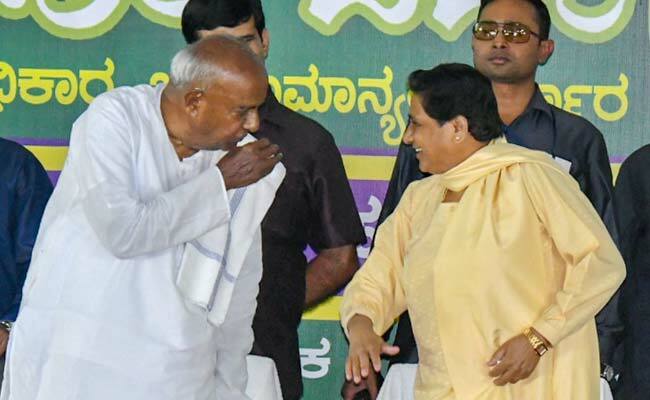 But when she showed up three hours late for a rally in Karnataka on Wednesday, it was interpreted as a cease-and-desist notice to her ally, HD Deve Gowda, over his allegedly growing proximity to the BJP - their supposed joint enemy. As the crowd waited in Mysuru, it was left to Mr Gowda's son, HD Kumaraswamy to furnish an explanation. "Mayawati is being pressured to end the alliance with us," he said to the 5,000-odd people waiting, not exactly a dream showing for a rally held this close to the state election on May 12. His comment acknowledged that talk of the partnership barely holding together is not off base. After Behen-ji, as she is called by fans, finally showed up, a senior leader from her party, N Mahesh told NDTV, "She has no reason to doubt Mr Kumaraswamy's word." 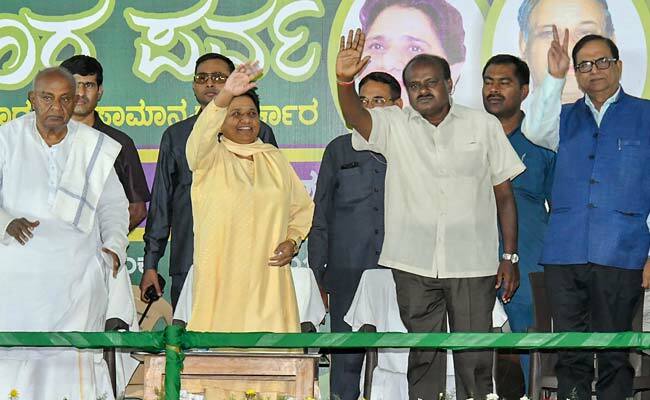 Mayawati attended a JDS election rally in Karnataka's Mysuru on Wednesday. But Congress president Rahul Gandhi and several of her own party workers have alleged that Mr Gowda has an unadmitted understanding with the BJP which includes him putting up weak candidates against theirs in several constituencies. Mr Gandhi has called Mr Gowda's Janata Dal Secular or JD(S) the "B-team" of the BJP in active pursuit of splitting the 10% percent Muslim vote in the region of Mysuru, traditionally loyal to the Congress with the JDS as its runner-up preference. Mayawati has been assigned 20 seats as part of the alliance with Mr Gowda. His party gets the other 204. Mr Gowda, a former Prime Minister, says he had offered the Congress an alliance but was rejected by Chief Minister Siddaramaiah, who left the JD(S) about a decade ago to join the Congress. His son, on the other hand, who has served as Chief Minister earlier, has maintained that teaming with the Congress was unfeasible. Karnataka elections: Siddaramaiah vetoed a Congress alliance with HD Deve Gowda's JDS. When Karnataka last voted in 2013, Mr Gowda's party got nearly half of its votes from forward or upper castes, in particular the Vokkaligas, the prosperous land-holding community which the 84-year-old belongs. The rest of the party's votes came from backward castes and minorities - it won 11 of the 40 seats reserved in Karnataka for candidates from disadvantaged groups. By feigning interest in the Congress, Mr Gowda wanted to assure his minority voters that he was keen on forming an anti-BJP front. His son, on the other hand, wanted the Vokkaligas to know that after the election, in case of a fractured result, as predicted by several opinion polls, his party was likely to work with the BJP. Richer castes like the Vokkaligas are far softer on the BJP than backward groups; they were also being assured that their votes would not go to waste, but in fact, could land solidly with a combination that would form the next government. "The Vokkaligas do not trust Mr Siddaramiah after the new census conducted by his government in 2015 slashed their population in the state from 16 per cent to 11 per cent while scaling up the numbers of the Scheduled Castes and Most Backward Castes. They fear that it may reduce their dominance in Karnataka politics and government," said Nagendra, who uses only one name and is an activist in one of the community's oldest organisations in the state, the Vokkaligara Sangha. "The Vokkaligas want to be assured that if they vote for the JD(S), the party will not support the Congress after the election," he explained. BS Yeddyurappa (second left) is the BJP's Chief Ministerial candidate for the 2018 Karnataka elections. The caste census he referred to was never formally presented by Mr Siddaramaiah's government, but its findings were leaked, allegedly to benefit the Chief Minister because backward castes were shown as having significantly grown in size, while upper castes had reportedly shrunk. The Vokkaligas are concentrated mainly in the eleven districts of south Karnataka that form old Mysuru. It is from here that the JD(S) won 24 of its 40 seats in 2013 (Karnataka has a total of 224 seats). Mr Gowda, a former engineer, appeals to his community of farmers by labelling himself 'Mannini Maga' or "son of the soil". In the last state election, the BJP was a non-performer in Old Mysuru, but a year later, in the national election, according to this survey it cornered 38 percent of the area's vote share as compared, outstripping the JD(S) which got 31 percent. The BJP's surge was on account of the now-legendary Modi Wave. The lead over Mr Gowda and his party will hold, claims the BJP parliamentarian from Mysuru, Pratap Simha, who is also a Vokkaliga and says the community's loyalty to the former premier has expired. "He was once hugely popular across Karnataka for improving the lives of farmers, but is an old man now, so his popularity has come down although he is still widely respected. Even Mr Kumaraswamy's best time is behind him and not ahead of him," he professed. He also contends that the BJP's self-defeating factionalism in Mysuru has been phased out. "We are united (now) and Mr Modi's magic, which swept the BJP to victory in 2014, will take care of the rest," he told NDTV. 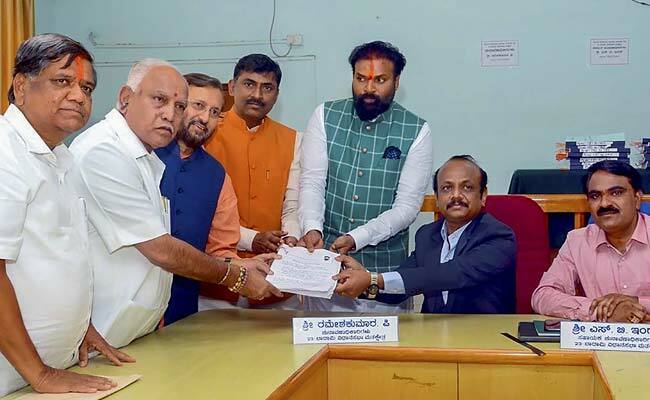 But to interlope into Mr Gowda's terrain, the BJP, traditionally seen as the party of the other dominant caste in the state, the Lingayats, last year acquired SM Krishna, a Vokkaliga leader from the Congress and former union minister. It has also sent top leaders to meet the influential seers of the Adichunchanagiri math or seminary in old Mysuru, the spiritual headquarters of the Vokkaligas. And allegedly pushed the under-the-radar deal with Mr Gowda. An array of opinion polls over the last few weeks have projected the BJP and Congress getting within a few seats of each other. In the absence of a majority, both parties would have to annexe the JD(S) to form the government. Mr Gowda is not trusted by either party - but his stock is higher in the BJP, which is also desperate to establish itself in the south ahead of the next national election. 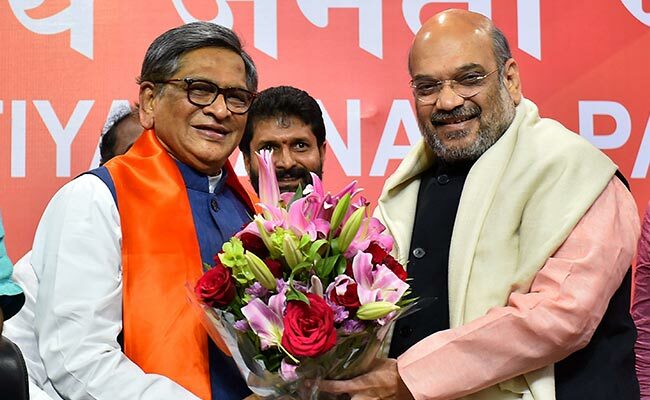 In 2006, the JD(S) ditched the Congress to take down Karnataka's first coalition government, creating the space for the BJP to easily win the state in the 2008 election. 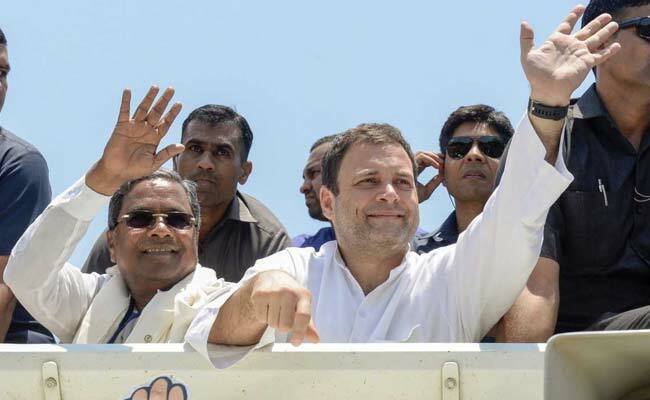 "It is unlikely the Janata Dal and Congress will come together, although this would be Deve Gowda's first choice," said Devraj Horatti, a senior JD(S) leader from North Karnataka. "but his son would prefer to go with the BJP, unless the Congress agrees to replace Mr Siddaramaiah (as Chief Minister)." So if the opinion polls prove right in their forecast of Mr Gowda serving as king-maker, results in Karnataka may serve as the start and not the conclusion of intricate politics.